The Bee Pastures of California. Part I. Ten numbered paragraphs reprinted from no. 145. Muir, John, "The Bee Pastures of California. Part I." (1883). 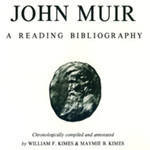 John Muir: A Reading Bibliography by Kimes. 123.